There are thousands of giveaways out there, so you just pick one, right? Not quite…well not at least if you want them to be effective and successful. Not all trade show giveaways are created equal. 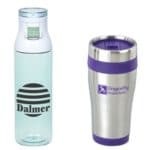 There are many unique promotional products that an attendee will find compelling at first, but will end up trashing at the end on their way out the show hall or hotel room. Don’t let yours be one of them. These items are to increase your brand recognition. Make sure your items carry the same branded messages, logos and colors as your other marketing materials to help reinforce your branding efforts and the companies vision. Practical giveaway items can present more value to visitors, creating greater long-term impact. The branded phone charger will get used repeatedly, while that puffy plastic key chain is more likely to get thrown in a drawer or in a trash can and never touched again. As you walk by booths you will see booths giving away the same pens, key chains and drink cozies. While these items may be okay, the standard fare won’t make attendee’s run to your booth. Are you looking for ways to announce the latest and greatest, enhance recognition, offer ideas or just connect with clients and potential clients? For a giveaway to be effective it needs to match your need. 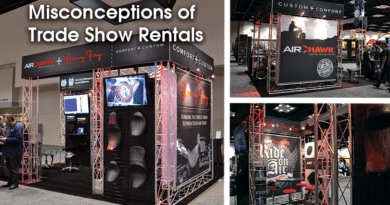 Sometimes pricier swag can create a buzz in your booth. It’s suggested to stash away fancier products for your VIP clients and real prospects…not the giveaway hounds. Quality over quantity is always the key – It’s better to hand out less items to select and targeted prospects than it is to hand out cheap items to everyone. The longer an attendee keeps your branded product, the longer your company stays on their mind and has the potential for others to see. While the baggy of chocolates or mints were deliciously eaten, as soon as the food is gone, your branded bag disappears into the trash. When giving food items consider giving two or give in conjunction with a longer shelf life item in order to extend the memory. Items, such as ear buds, will remain around for a much longer period of time. Every piece of swag at every single booth is going to be branded, so go the extra mile and make your freebies stand out in a playful, unique sort of way. 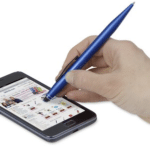 If you’re going to give away a pen, make sure it’s a higher quality pen. A quality item is going to send the right message to your prospects, while a cheap, trashy item will do the exact opposite. “Variety is the spice of life”, so offering a few different giveaways, verse just one, will ensure you are capturing a larger audiences interest. You are also less likely to run out of any one item. Technology items are a big hit and a portable power bank is no exception. While being small enough to put in your pocket, these portable power banks pack a lot of punch, allowing you to charge your mobile devices on the go. They help to prevent your attendees from being “device-less” while simultaneously having your brand name involved in their daily lives – It’s a win win! With all that talking taking place on the show floor, attendees lips are bound to get chapped. 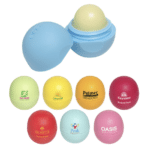 Branded lip balm will remind attendees of you every time they reach in their purse or pocket to moisturize their lips. It is suggested to stay away from overly strong flavors that might turn people off, though…stick with plain or more generic choices to appease the masses. Nowadays, pretty much everyone has a tablet or smart phone where one of these can come in handy. Like pens, try to get the quality ones. Test them out before you make the purchase. If you find it useful, your prospects and clients will too! These are always a crowd pleaser. Who doesn’t need a pair every now and then, especially if you are a frequent traveler. A promotional pair of headphones can be a lifesaver for the music or audio book lover. Bluetooth speakers are great to use outside of the show as well. 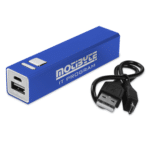 These fun tech items can easily be customized to feature your logo and brand colors. Everywhere you go, from the office to the park, you see people carrying reusable water bottles and coffee mugs. Quality water bottles and travels mugs are always a good giveaway that can be used instantly on the show floor to keep prospects hydrated and then reused long after the show has passed. Remember, that while a giveaway may entice someone to the booth, it is up to you to capture some information from that attendee so that your sales team can follow up with them after the show. You are not just there to frivolously hand out promo products. Fewer items given to the right people are better than handing out junk to everyone. Ask questions and take pictures of your prospects with their promotional item and share it on company social media platforms. Make your promo items work for you. 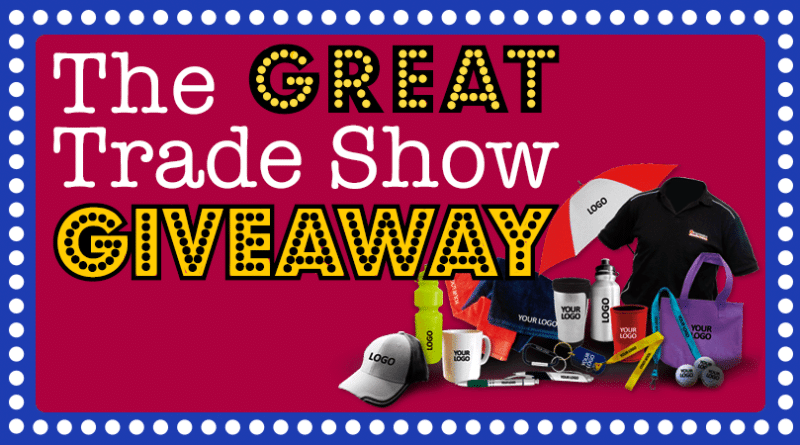 Picking the perfect trade show promotional product can be challenging. Just remember, the right giveaways impact will stay with a visitor long after the show, making your effort pay off in the end.